Developed for exploration of the South Pole, after his job there ended he took a job at a frozen food warehouse. He can manipulate and control ice, using it to attack, among other things! IceMan's a tough fight for melee characters especially due to the slippery floors in his boss room. 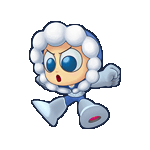 However, if you time your jumps with the Ice Slashers that IceMan shoots your way and stay close to the ground you should be able to avoid his attacks. IceMan also has the ability to create icicles that till fall into the ground. While these can cause significant damage to your character if hit - these also provide excellent standing platforms giving you an edge if you know how to use them.